Gravity Runner is an incredibly interesting iPhone game. You play a sidescroller platforming game where you run constantly and the only real control you have is jumping. The trick is that as you play, you start learning anti-gravity. You learn how to defy gravity by jumping in midair to suddenly flip gravity upside down to walk on ceilings. This app is available for the iPhone, iPod touch, and iPad and is developed by We Are Colin Ltd. You can buy this game for $0.99 at time of writing. Whenever you reverse the gravity, you can run on ceilings, using momentum of falling to extend your jumps past pits and spike traps. This is just great as it presents all kinds of interesting platforming challenges and really puts an emphasis on timing and level memorization though repetition. Graphics really remind me of Super Mario with some blockier pixels. The colors are nice, everything pops, and the main character is pretty well animated. There are powerups and extra gravity flips that really extend this game from simple platformer to a truly unique experience. The sounds effects are nice. The level design in Gravity Runner makes for super challenging gameplay. 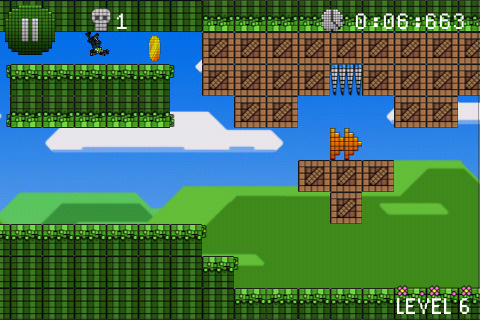 For example, there is a level in the game where there are three separate paths, and 2 have run powerups that move you faster while the middle path has nothing. Running in either of the two power-up paths will make you run face first into a spikey death and only the middle path is safe. This seems like a an unfair instant kill and a beginner’s death trap. Despite the aggressively grueling levels in some parts, much of the game is innovative; the world of the game is interesting and fun. The fast pace combined with Sonic the Hedgehog style memorization to achieve the best time is in fact accurate to classic games. AppSafari review of Gravity Runner was written by Joseph Ho on September 9th, 2010 and categorized under App Store, Games, Physics Based, Platformer. Page viewed 4074 times, 2 so far today. Need help on using these apps? Please read the Help Page.